A hardtail mountain bike to take to the hills. 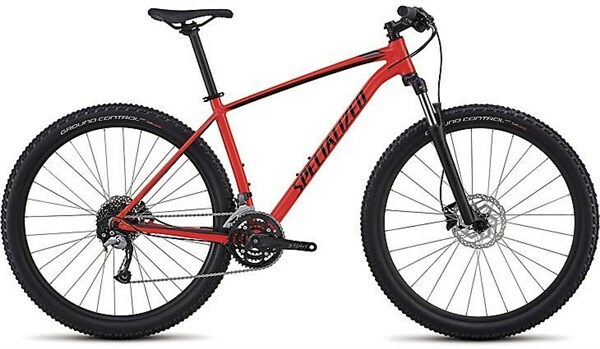 The Specialized Rockhopper Comp is great for exploring trails and is a fantastic bike to find your MTB feet with. With an A1 aluminium frame that’s both lightweight and robust, the 29” wheeled Specialized Rockhopper not only looks good, but is built with fun in mind. The Sport XC 29 Geometry optimises the angles of the bike to ensure stability on descents and nimble handling on technical trails and while climbing. A tapered headtube and internal cable routing brings the frame up to date. Suspension duties are taken care of by the SR Suntour XCM fork. It has 80mm, 90mm or 100mm travel, depending on the size, maintaining the same experience across the range. It features a Multi-Circuit damper that helps soften bumps while avoiding that bouncy feeling commonly associated with coil forks. The Shimano 3x9 speed drivetrain combines Acera and Altus components to offer reliable shifting and a wide range of gears for any situation. Keeping speed in check are Shimano M315 hydraulic disc brakes, which give all weather stopping power. The double-wall Stout XC 29” rims have a wide, 25mm internal diameter that fully supports the front Specialized Ground Control Sport and rear Fast Trak tyres. The tyres feature Flak Jacket protection to help prevent punctures. Develop your mountain biking skills on the Specialized Rockhopper Comp.